KUSNER AND AMANN RECLAIM TEXAS for what it ​always was, home of the wanted poster of outlaws, artists and renegades — often answering to the same name. ​With sly humor and startling visuals, the creators peel back layers of the sacred and the profane until you realize they were always joined at the hip. And “214 Trans4m” is the hippest in all of Texas! BEAUTIFULLY WRITTEN, THIS FUN PHOTO BOOK raises fascinating questions, like: Is Dallas true to its conservative stereotypes? Can lovingly recreated photo shoots with larger-than-life drag artistes shed new light on Big D’s many historical landmarks? And the most important question of all: How easy is it to pass as a woman at the Triple Underpass? These eye-popping pics may have resulted in a triple bypass surgery for many driving past the photo sessions. But Dallas isn’t just about campy Southern women with big hair. This fascinating new volume offers concrete proof that Dallas “women” also have big hands, big feet, big Adam’s apples and lord knows what else. They don’t call it Big D for nothing! Kusner and Amann clearly have a deep love for their home, and they throw in off-beat tidbits of the city’s rich history along with loads of guaranteed giggles. — LADY BUNNY, founder of Wigstock. ​POSING TRANSGENDER MODELS AS DALLAS institutions such as Mary Kay Ash and Marina Oswald, along with legendary visitors to the city — Maria Callas, Jacqueline Kennedy, Tina Turner — Kusner and Amann’s “214 Trans4m” turns stereotypes upside down. Their photographs range from the eccentric to the emotionally riveting.... For instance, their unforgettable images of “Jacqueline Kennedy” (Aaron Ballinger) in a cascade of right-wing leaflets “welcoming” her husband to Dallas in November 1963. The leaflets are real, like the venom that produced them, but this Mrs. Kennedy is a postmodern myth who stands as tall on the 21st century landscape as any creation by that other mythmaker, Cindy Sherman. 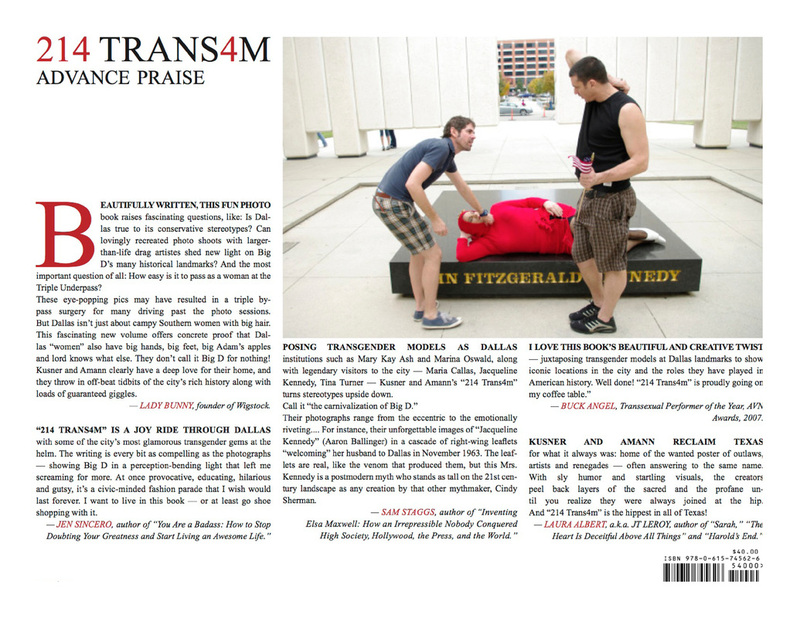 “214 TRANS4M” IS A JOY RIDE THROUGH DALLAS with some of the city’s most glamorous transgender gems at the helm. The writing is every bit as compelling as the photographs — showing Big D in a perception-bending light that left me screaming for more. At once provocative, educating, hilarious and gutsy, it’s a civic-minded fashion parade that I wish would last forever. I want to live in this book — or at least go shoe shopping with it.